Kathy Davis is an artist, author and business owner whose expressive painting and hand-written messages have inspired millions since she started her business over 25 years ago. From a small drawing table in the corner of her bedroom, she began her pursuit to create a life she could love, one greeting card at a time. Today, the former teacher turned artist and entrepreneur acts as chief visionary officer of the company that bears her name. With the variety of products she creates, Kathy scatters joy to more than 90 million consumers worldwide each year. Approximately 125,000 Kathy Davis greeting cards are sold daily by American Greetings, and over 400 million have sold in her career. 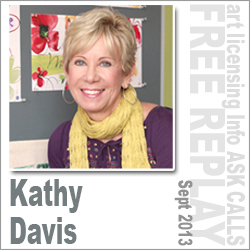 Kathy shares her humble beginnings as an art teacher right up to her current success in art licensing. Offering advice and tips for anyone getting into art licensing, Kathy also shares her thoughts on relationships with manufacturers, and working with one of the largest greeting card companies in the world, American Greetings.